Our team of experts are often called upon to provide floor restoration and repair services to wood floors. Perhaps it is a beautiful hardwood floor, discovered under a carpet or maybe a neglected parquet floor in a historic home that is in need of some care and attention? This type of work requires expert skill and knowledge and is right up our alley. Floor filling falls broadly into two categories. 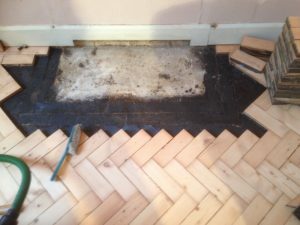 Firstly the filling of minor blemishes such as nail holes, shakes and cracks and secondly the wholesale filling of shrinkage gaps such as is likely to occur in wood block or parquet floors. There are of course different ways to handle each situation and our team of experts is uniquely qualified to deal with both requirements. If you have a wood floor that needs repair or restoration, why not call one of our experts now. If you want more information on some of the floor restoration and repair projects we have been involved in, please see our blog posts for a flavour of our work. Call 0161 5072413 to arrange a free consultation and quotation from one of our experts.